Flashnote is just a rough copy for your quick work with any text information. 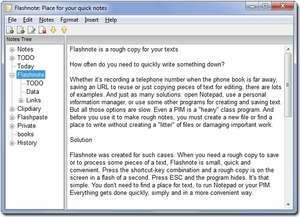 When you need a rough copy to save or to process some pieces of a text, Flashnote is small, quick and convenient. Press the shortcut-key combination and a rough copy is on screen in a flash of a second. Press ESC and the program hides. Version 4.81 is a freeware program which does not have restrictions and it's free so it doesn't cost anything. For security reasons, you should also check out the Flashnote download at LO4D.com which includes virus and malware tests. Additional screenshots of this application download may be available, too.